This huge international bestseller, fully revised for non-American readers, is now in ebook. 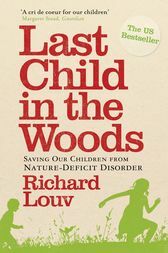 Last Child in the Woods shows how our children have become increasingly alienated and distant from nature, why this matters, and what we can do to make a difference. It is unsentimental, rigorous and utterly original. Camping in the garden, riding bikes through the woods, climbing trees, collecting bugs, picking wildflowers, running through piles of autumn leaves... These are the things childhood memories are made of. But for a whole generation of today's children the pleasures of a free-range childhood are missing, and their indoor habits contribute to epidemic obesity, attention-deficit disorder, isolation and childhood depression. This timely book shows how our children have become increasingly alienated and distanced from nature, why this matters and how we can make a difference. Last Child in the Woods is a clarion call, brilliantly written, compelling and irresistibly persuasive - a book that will change minds and lives.